We have been a supporter of ALO’s street art since he first appeared in London 3 years ago and are delighted to see his increasing acclaim and rapid progress in the “proper” art world. Following appearances over the past 12 months in Group Shows in the Fun Factory pop up gallery in Shoreditch last Summer, via an appearanace in Stolen Space’s Winter Group show alongside luminaries such as D~Face, Shephard Fairey and Rone, ALO has suddenly stepped up a level with a solo show at the Saatchi Gallery on Kings Rd, London. For a full appreciation and a selection of images from the show, head over to the review on Graffoto. This entry was posted in News and tagged Basquiat, expressionism, fine art, Gallery, German, Jean Michel Basquiat, London, Saatchi, Shoreditch, show, solo, Street Art, street artist on 08/14/2014 by Shoreditch Street Art Tours. Roa’s new installation based show opened at Stolen Space Gallery last night and is just as dark and rough and briliant as you’d hope for from this star. Virtually all of the images here look like ROA could just as easily have painted these on the streets as indoors in a gallery and it has been a while since there was a show that managed that trick. This entry was posted in Artist and tagged animals, London, painting, Roa, Shoreditch, show, Stolen Space, Street Art, Tour, Walk on 06/13/2014 by Shoreditch Street Art Tours. Alexis Dias aka “La Pandilla”, whose Octophant mural in Shoreditch continues to amaze passersby some 8 months after its completion, joins forces with Jaz the Argentinian graffiti legend in “La Linea”. Pure Evil gallery takes credit for introducing us to many street art talents we have never seen before so we look forward eagerly to the work of Pro176. Look in the Pure Evil Department Store a few doors down from the usual gallery location. And yes, that’s how they have spelt the title on their email so that’s what it must be. At Art 14 fair last week there was a Brett Amory canvas which was breath taking portraiture. In this new show London is treated to the Brett Amory project where he spends 24 hours visiting 24 locations in one city and using the visual experience to inform a series of paintings. He has already executed this project in New York and San Francisco and we look forward to seeing his impressionist urban take on some London locations. LA guys Cyrcle visited London a couple of years ago to decorate our streets with some impressive pasted collages and they return for this show at StolenSpace. They have been braving the reign, sorry – the rain on a hoist painting a very large mural in a car park as part of their London fun. Here are a couple of pieces from their 2012 visit. Ahead of all that Thursday night excitement, Blair Zaye (remember the drainpipes dripping paint down the Shoreditch walls last year?) has a solo show in the heart of the City of London. This entry was posted in News and tagged Art, Artist, Gallery, Graffiti, London, Shoreditch, show, Street, Street Art, Tour, Walk on 03/05/2014 by Shoreditch Street Art Tours. and that’s the opening of a new solo show by French stencil maestro C215. I believe this is his 4th solo show in London and that’s not including the project installation at Moniker Art Fair 2012. 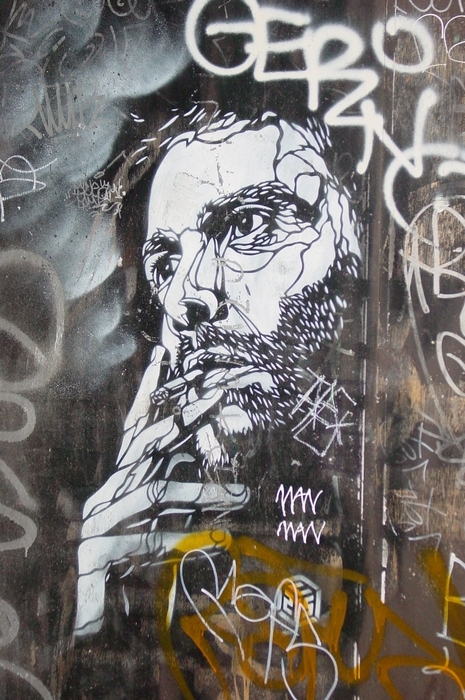 C215 was a revelation when he first brought his complex stencils to London’s streets in early 2008. He became a huge star of Banksy’s Cans Festival that year and has been a frequent visitor since. He is an energetic traveller and some of his best work appears in remote developing countries where he has an uncanny knack of getting up stencil images which reflect the community he is visiting. We anticipate unusual non-canvas painting surfaces being given the C215 multi layer stencil treatment. Show runs 7 Feb to 2nd March 2014, don’t miss! This entry was posted in Artist and tagged C215, Gallery, London, private view, Shoreditch, show, Street Art, street artist on 02/05/2014 by Shoreditch Street Art Tours. Three intriguing shows open this Thursday (28th), none of them in Shoreditch. RSVPs required for all these events. Anyone who saw Giles Walker’s “Last Supper” gothic bacchanalian animatronics extravaganza at Black Rat Press back in 2012 will be praying for more of the same, though how his more potty mouthed creations might interact with the waif-child terror of Candice Tripp will be fascinating to see. This is just on Lower Marsh at the far exit from the Leake St tunnels and the gallery is saying that all private view slots are fully booked and your best bet if you aren’t booked is to catch the public opening from Saturday. Although this was very much a Washington/East Coast thing, quite a few here in the UK will recall observing the mist of confusion and controversy among American fans as to whether Borf was a collective, a concept or a tagger. The spirit of whimsical slogans and tagging captured on canvas, or abstract colour scribbles? We’ve been big fans of the work of Cyclops for many years, a fine art education has moved him on a long way from the Basquiatesque images of the middle of the last decade. What is curious is the reversion to his street artist pseudonym rather than the real name that has appeared over the door in more recent shows. This entry was posted in News and tagged Borf, Candice Tripp, Cyclops, Gallery, Giles Walker, London, private view, show, street artists on 11/27/2013 by Shoreditch Street Art Tours. Bit of an early “heads up” this week to which artists are showing what where, mainly because of a double header courtesy of Nelly Duff and Aurum Press which is on Wednesday, I mean, crazy or what? Nelly Duff are putting on a show illustrating the production of EINE’s Tenderloin A-Z screenprints, and of course prints will be for sale. At the same time, Rafael Schacter releases his book and it appears a random 10 copies have Eine spraypaint on the cover. And another reason why I look forward to this is that Rafael may have included a number of my photos of various artists repping London. RSVP essential and apparently they may be “staggering “ admission but what s the rush, whose to say the Eine hand finished books won’t be the last 10 sold (though of course the screen prints are strictly limited). THe location for this extravaganza is being kept secret but should be announced any moment……any moment……. This first original show from Radiohead’s cover artist is a definite must not miss. Expect increased sentimentality and pastoralism, apparently. T.Wat is a long serving London based stencil street artist who reacted to the Snowden NSA leaks with that “America’s all ears” paste-up. This entry was posted in News and tagged Art, Artist, Gallery, London, Portobello, Shoreditch, show, Street on 09/17/2013 by Shoreditch Street Art Tours.